Arriving to a crowd on their feet, John Mayer and his eight-piece band walked silently onto the stage and opened the show. Some bands do this to create mystery, Mayer later told us, but it doesn’t work for him. He is too open, unabashed. So much so that during the set he lamented that sometimes it’s hard to know, mid-song, if a crowd even cares about the song he’s playing. The set was stripped back, save for the ensemble cast of two back-up singers, two guitarists, a drummer, keyboardist, percussion, a base player and a myriad of guitars, plus a monolithic tie-dye backdrop – Mayer is a huge Dead-Head. Mayer had chosen to fill the stage with things of importance, rather than clutter. He was dressed in a simple boxy tee, cream cargo pants and wore Nikes – Mayer is a massive sneaker-freaker, too. Nike x Sacai LDV Waffle’s to be exact. Note the choice, because he missed his chance in celebrating Air Max day. Though you could tell it was much to his disdain, Mayer headed requests from the crowd – admitting that the songs mentioned were actually good ones. The set list covered deep cuts as well as the hits. ‘Heartbreak Warfare’ received an extended guitar solo from Mayer, and performed both ‘Waiting on the World to Change’, and ‘Slow Dancing in a Burning Room’ as teased out renditions. Performing over two hours, the set was broken into two halves with an intermission. Mayer opened up more in the second half, physically too. Joking with the crowd when they wanted him to “bring it”, he stretched out his legs and ripped into the rest of the set. He relished in “dancing like a schmuck” to ‘New Light’, a track that synthesis all of Mayer’s sonic achievements and tonal signatures. Mayer detoured into his lost year, 2011, with ‘Whiskey Whiskey Whiskey’. A year, he concedes, he spent hiding behind long hair, a beard, and “lots of layers”. Although Mayer didn’t spend much time talking throughout the performance, when he did, he gave the crowd plenty to think about. When the set closed, the crowd lit up their phones in anticipation. Mayer returned, lit only by phone flashlights, and performed an encore of ‘Gravity’ on Instagram live. 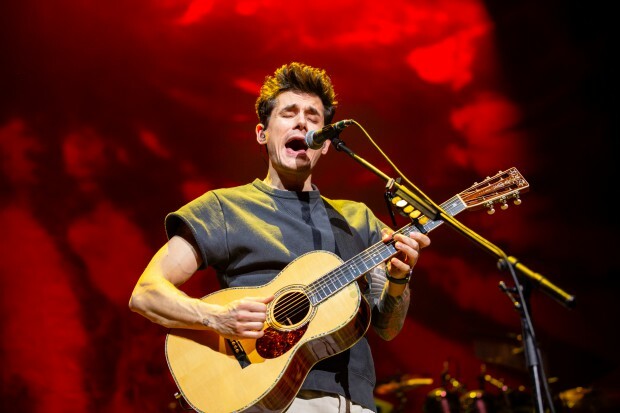 Though Mayer is prolific on Instagram, the show offered little fodder for the social media platform – something he talked to the crowd about briefly. Overanxious we are, Mayer thought, far too over anxious. Mayer was quick to realise the hypocrisy though, noting he hasn’t felt “100%” since maybe the late 90’s. Another bittersweet realisation was found during Mayer’s concede that growing up talented saw him alienate people with his “arrogance”. It was all for a greater purpose, a burden he has carried. And wasn’t he right in sticking it out.